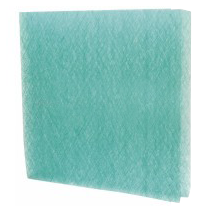 We highly recommend the use of premium filters throughout your paint spray booth. By using filters that are lower in efficiency and/or using filters beyond the point that they should be changed, operators increase their costs--drying times are extended, there are more incidents of booth down-time, increased dirt in the paint jobs means more buffing, inconsistent booth performance keeps the painter from getting a feel for how the booth or refinishing station operates, and the fuel costs for heated equipment go up because of burner contamination and bad airflow. This information was supplied by NorAM Inc. , paint spray booth manufacturer.